Will Mickey Rourke Take On Genghis Khan? What’s a guy to do after he’s already done battle with a fully armored Tony Stark in Iron Man 2, teamed up with Stallone and Schwarzenegger in The Expendables, and led his fellow Greek Gods in a revolt against mankind in Immortals (a.k.a. War of the Gods)? Why, return to the battle, of course! 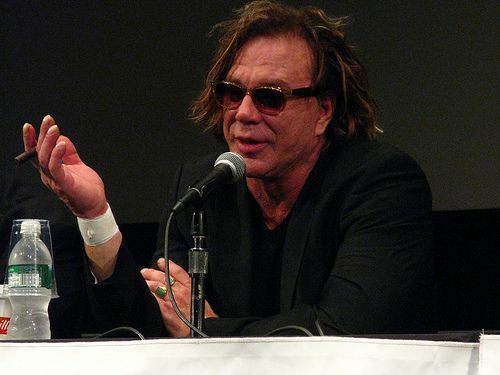 It seems safe to say that Mickey Rourke is experiencing more than just a comeback. His career’s second life is proving to be even more substantial than its first. In an interview with the Orlando Sentinel, Rourke revealed he may be taking on the role of one of the most infamous conquerors in history of the world: Genghis Khan. Hit the jump to find out what the always-eccentric Rourke had to say about his involvement in the film (which is being penned and directed by John Milius of Red Dawn fame) and also, for some more insight into his awkward obsession with dogs. So to sum up, Mickey Rourke is not Asian, but he can pull off a mean horseback ride and and he really, really loves dogs. Obviously, no further preparation to play the role of the creator and leader of the Mongol Empire will be necessary. It’ll be really interesting to see if this rumor ends up being true.